On May Day, Vermont’s state capitol rocked to chants of “Hey, hey! Ho, ho! Insurance companies got to go!” and “The system, let’s stop it – My health is not for profit!” as over 1000 people took a day off from work or school for a boisterous Health Care is a Human Right march and rally. Union members, including hundreds of nurses and other healthcare workers, community activists and youth converged for our largest weekday statehouse rally on record. 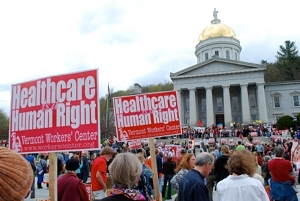 While sentiment for single-payer has been strong for years, this rally reflected a year of strategic organizing by the Vermont Worker’s Center in a grassroots Health Care is a Human Right Campaign. The Workers Center has worked to build and train organizing committees across the state, polling over 1,500 Vermonters to hear their experiences with the health care system, and holding local hearings. The Campaign is enlisting a growing number of workplace activists who are reaching out to their coworkers. The Workers Center has linked the campaign with public sector workers’ resistance to layoffs and cuts in wages, benefits and public services. There is a growing disconnect between our Republican governor/legislature (with a “veto proof” Democratic majority), who have spent the year cutting programs and services and laying off state employees, while refusing to take up single-payer legislation which languishes in committee, and most Vermonters who recognize that health care is a human right, that it is a public good. Speaking at the rally, Senator Bernie Sanders, I-VT, praised the turnout, “You are part of a struggle to transform the basic values of the United States of America…You are saying loud and clear that health care is a human right for all people, not just the privileged or those who have a lot of money.” Sanders also announced that he has introduced a bill in the Senate which would make it possible for five states to establish single-payer, providing federal waivers to create one public pool covering every resident. 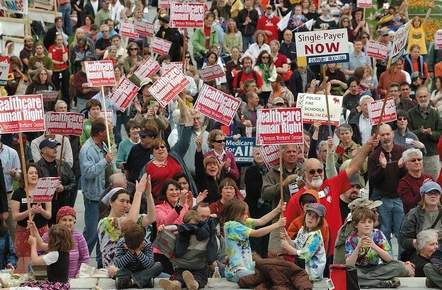 As citizens rallied, the Vermont House passed a resolution endorsing both H.R.676, the Expanded and Improved Medicare for All Act, and S.703 sponsored by Sanders, which would establish a state-based health security program providing health care to all. Over the next period, the Campaign plan is to strengthen local organizing committees, building the power necessary to counteract the insurance and pharmaceutical interests, and make lawmakers carry out the will of their constituents. The Vermont Workers’ Center is part of Jobs with Justice, Labor Campaign for Single-Payer Healthcare, Grassroots Global Justice, and partners with the National Economic & Social Right Initiative.